I feel like I’ve learned a lot about fabrics in the last couple of years. I have been sewing for a long time, and I’ve made lots of mistakes. I’ve made clothing that didn’t fit right. I’ve used fabric that was too light for an item or too heavy for an item. I still make mistakes or don’t think items all the way through, but the important thing is that I’ve learned from my mistakes. Along the way I’ve learned my shape and measurements, I’ve learned which silhouettes I like, and which fabrics I like to sew with. I feel like I’ve gotten pretty picky with my fabrics, and maybe they cost more, but I’m not buying as much and each item lasts much longer. Also, there are polyester or synthetic versions of all of these fabrics, but personally I choose not to wear polyester because I get so uncomfortable. 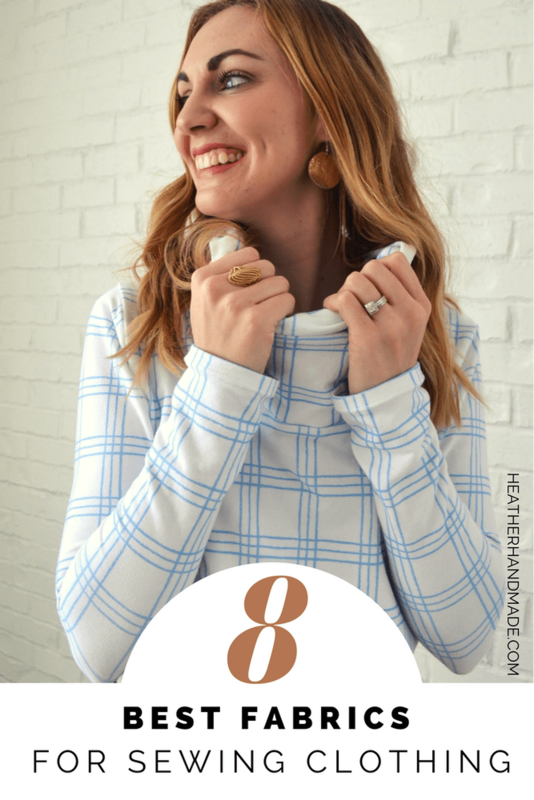 After all the mistakes I’ve made, I’ve figured out what my 8 favorite fabrics for sewing clothing. 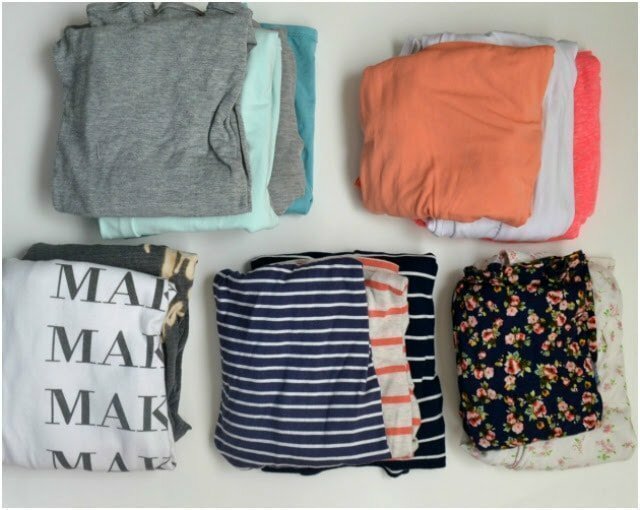 If you don’t sew a lot, these are still good fabrics to look for when purchasing a RTW item. I’ve made a couple of items out of rayon challis*, and I loved working with it. I’ve bought more because it’s a fabric I love sewing with and a fabric that I love wearing. It’s a woven that’s fairly easy to work with and some kinds can be pretty slippery. It is opaque, fluid, and cool for when it’s hot. Rayon challis works well for fluid tops, fluid dresses, and fluid skirts. Rayon challis will not work well for a fitted item because it’s not strong. It works best for loose or semi-fitted silhouettes. I love this watercolor rayon challis* and there are tons of floral rayon challis* fabrics to choose from. I have sewn with so many different cotton lycra* fabrics and weights. I can’t even count how many items I have made using cotton lycra. Some is definitely better quality than others, and I like to get 8 oz or more so that it’s easier to work with and not transparent. Cotton lycra works really well for fitted tees, fitted skirts, and thin leggings. I even use remnants to make underwear for my kids. My favorite is solid cotton lycra*. My solids always get way chosen and worn way more than any prints. 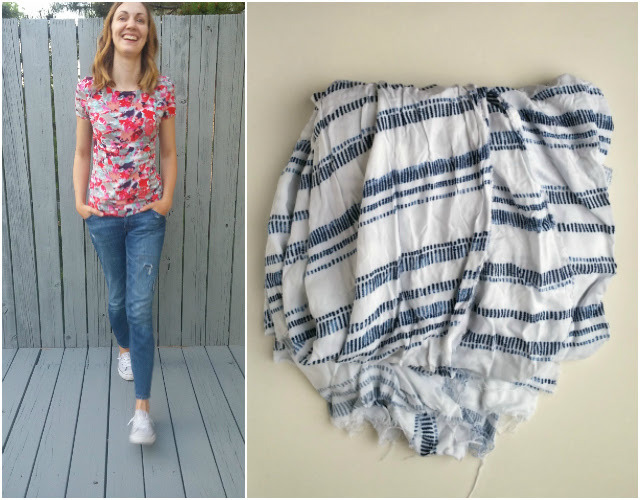 Cotton spandex is also one of the easiest knits to sew with. I have a deep love for Tencel*. Once I made my denim joggers from it, I was completely sold. I have since purchased a tencel utility jacket, thrifted a tencel button down, and any other Tencel item I’ve found at the thrift store. Once I touched and sewed with tencel, I only want to touch and sew with tencel. I literally can spot it from across the room because of the slight shimmer it has and the way it moves. Tencel has similar in drape and hand to rayon challis, but it’s much stronger. 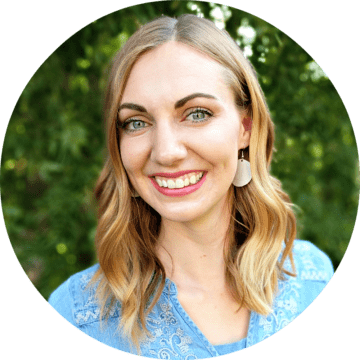 Tencel and rayon are basically the same thing, they are just manufactured slightly differently. 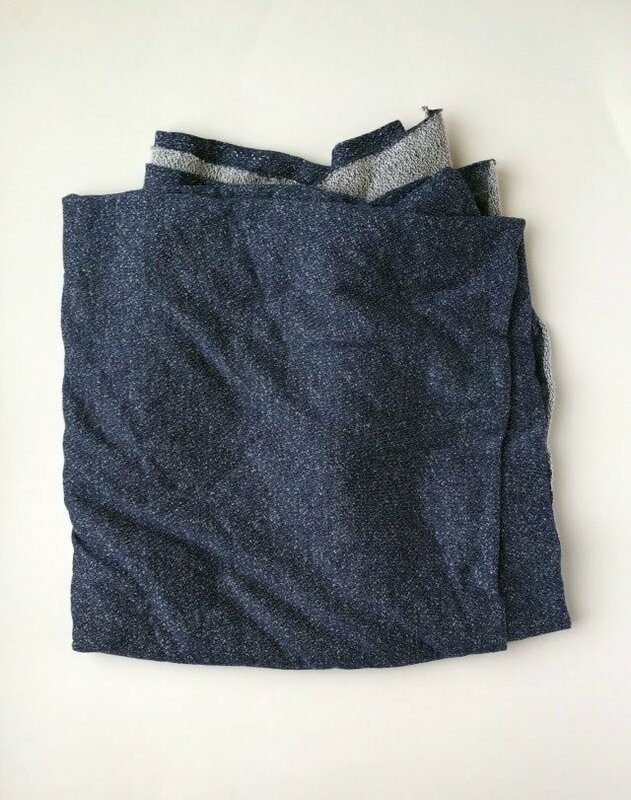 I’ve also noticed that Tencel fabric I purchased was stronger than purchased tencel RTW items. There also lyocell* which is the un-trademarked version of Tencel. I haven’t noticed a huge difference between the two, but I have been able to compare them very much. 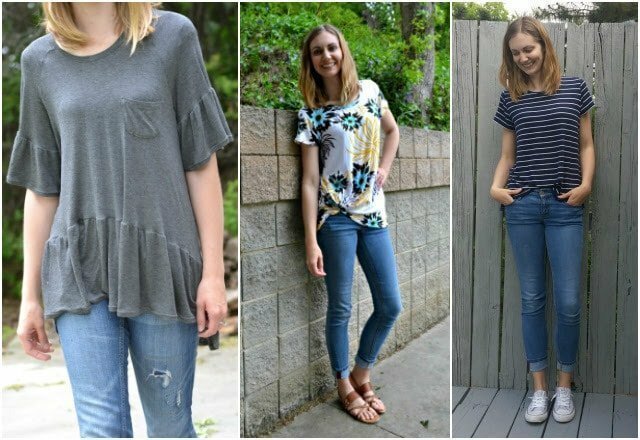 There are lots of loose, drapey styles that are popular right now, and lots of new patterns to reflect this. The best and most inexpensive fabric to use is rayon spandex jersey*. I have only ordered a couple of rayon spandex cuts, and I would be careful about weight and quality. Rayon spandex is a little bit trickier to sew with since it’s so lightweight, but after some practice you can sew with it. I like to use rayon spandex for drapey tops, drapey tunics, and drapey dresses. Rayon is made from wood pulp, and there’s also bamboo rayon spandex* which is bamboo. It’s more expensive, but easier to sew with and rarely transparent. It feels like really fancy fabric, and it holds up better to wear than regular rayon. French terry* is a warm, soft, comfortable to wear, and easy to sew fabric. It’s great for hoodies, sweatshirts, and shirts. It’s my favorite for winter items. French terry has a wide range of stretch and a wide range of weight so be careful when looking online. I bought one once and it was more like a transparent rayon spandex, but then I’ve sewn with one that had almost no stretch and a thick weight. French Terry fabric comes with spandex and no spandex, and it comes with a lot of stretch or little stretch. You really need to touch it or ask for the stretch percentage. This might seem silly but I think linen* is one of the most luxurious fabrics. If you dry clean it, it keeps it’s special almost shiny coating. If you wash it it gets softer and softer with wear. 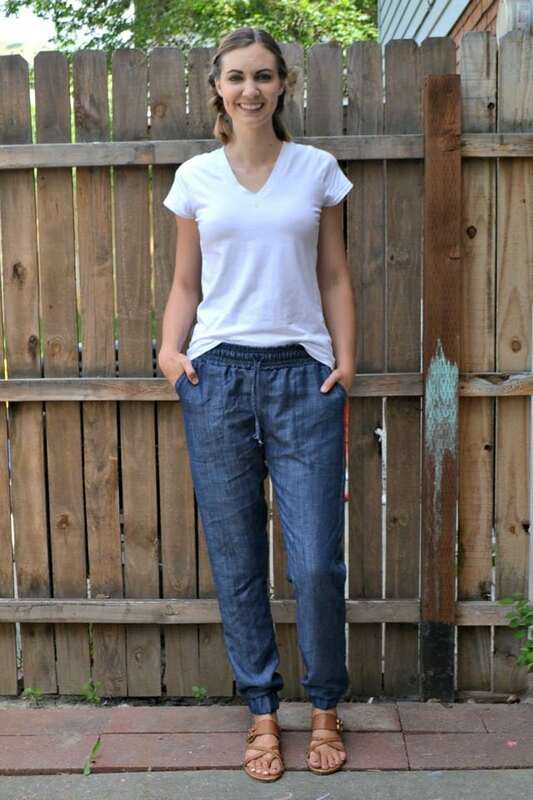 I like linen for structured but not too fitted tops and jackets, and summer pants and skirts. It doesn’t do well when it’s really fitted because the fabric can tear easily. I’ve been eyeing this cotton linen stripe in sky* for awhile. Wouldn’t it make the most amazing jacket? Chambray* is a lightweight woven that has white yarn in the weft and colored yarn in the warp making it a subtle multi-colored fabric. It’s perfect for tops and lightweight skirts. I like it because it’s such a great basic neutral. Since it has subtle color differences you can see the texture, but it reads like a solid. 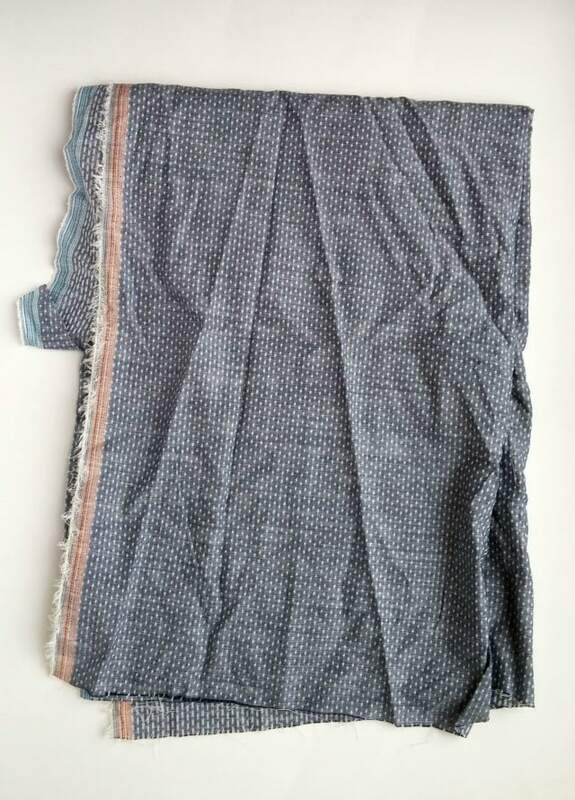 I have purchased this union dots indigo chambray* which is woven to have the white yarn peek out like dots. I love it and wear it all the time. I don’t often recommend quilting cotton for clothing since it’s so stiff, but you can use quilting cotton for fabric. The only garments I recommend it for are fitted button downs, bows, boys’ button downs, and little girls’ dresses. It’s also great for women’s pencil skirts or fitted button down shirts. Quilting cotton works best for fitted items. I’m currently making two girls’ dresses using this Triangle Quilting Cotton* and this Floral Quilting Cotton*. Quilting cotton is really easy to sew with and comes in all kinds of colors and prints. It’s really inspiring to walk through rows of quilting cotton. If you want to learn more about each of these fabrics, you can read all about fabrics in the book Fabrics A to Z! 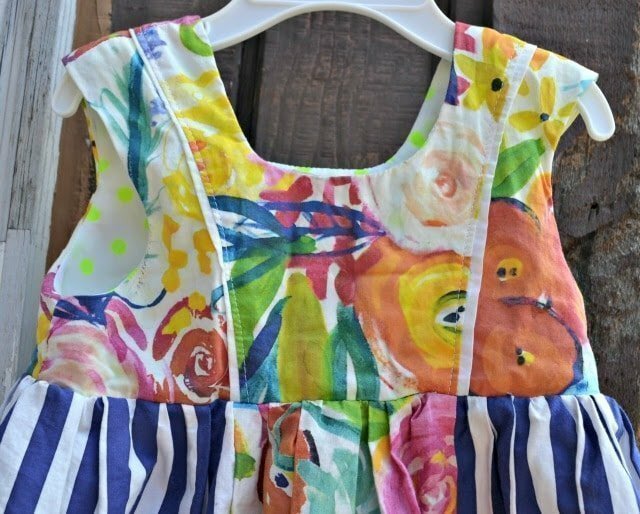 What are your favorite fabrics to sew with? Great post! I think I have to agree with almost everyone of these. I've been eyeing that same linen, but to make a fit and flare dress with horizontal stripes on the bodice and vertical on the skirt. Oh that would be beautiful! You have recommended the A-Z fabric book, and I really want to get that! I wish we could have a touch and blog post thing going on. I would love to know what tencel feels like. Guess I need to go to the fabric store!